I'd say both definitions of "rustic" apply pretty well to this apple tarte. Sonia and I, now residing in rural South Jersey, have never lived anywhere more rustic in our lives. And as chance should have it, we got a free slice of homemade apple pie from a local roadside produce stand just the day before we heated up our Trader Joe's Rustic Apple Tarte. The farmers' apple pie was scrumptious. Absolutely amazing. Sonia and I both agreed it was possibly the best apple pie we had ever had. Granted, nether Sonia nor I grew up in homes with mothers or grandmothers cranking out fresh-baked apple pies at all...like, ever. Sadly, McDonald's apple pies in the little green cardboard boxes were about the best we had ever had as kids. But we were in absolute agreement that this roadside stand had just set the bar for near-perfect country-style apple pie. But the very next day, TJ's gave our local farm market a run for its money. We could get into the semantics of how tartes (or tarts) are very different from pies, but if we're honest with ourselves, we'll all agree that their similarities outweigh their differences. They're basically the same animal as far as I can tell—at least when comparing this tarte with this most recent sample of apple pie. 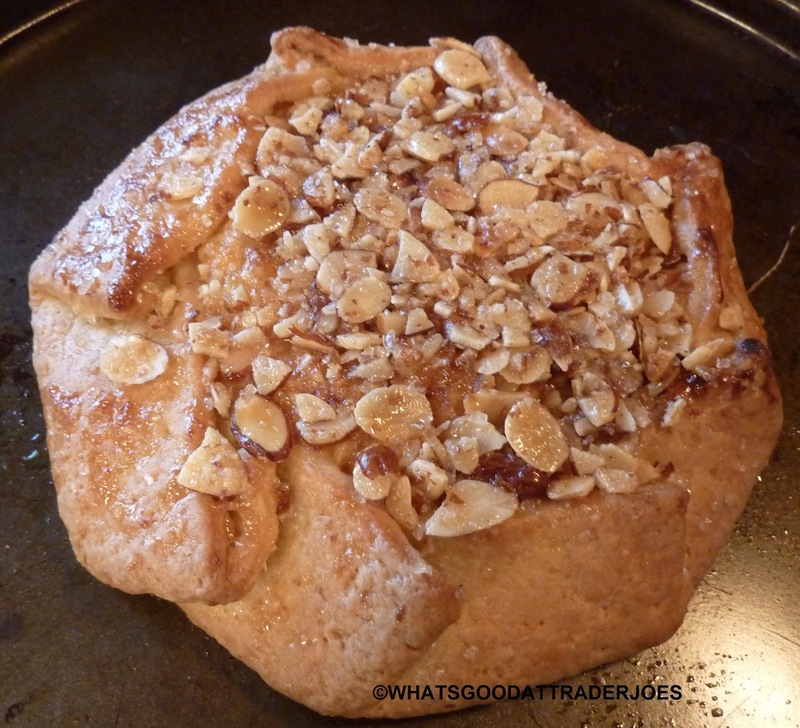 Trader Joe's offering would never have stood out in our minds had it not looked, felt, and tasted homemade. But it did. Straight out of the oven, the smell was heavenly. I was shocked how soft everything was when I cut that first slice. The crust was buttery and flavorful, and there was just the perfect amount of it. It was perfection in and of itself, and yet it took nothing away from the apples. There were tons of apple slices and slivers throughout the pie. In my mind, they were definitely the main attraction. They still had enough crispness to feel like apples, but they were supple and sweet enough to feel like a delicious baked dessert. The syrup was very sweet, and if anything, was the weakest part of the pastry. It was just a tad too sugary, even for me. And I feel like had it been just a mite bit less overpowering that it could have let the natural apple flavors through even more. But to complain about it would be unfair, since it is dessert after all, and is meant to be quite sweet. The most pleasant surprise—and in many ways the most "TJ's-esque" thing—about this tarte was the layer of candied almond slivers on the top of the confection. At first, I thought it was granola of some kind, but upon closer inspection, they proved to be little pieces of almond. They added a welcomed crunch to the texture and...well, a nuttiness to the flavor. Also the use of "Northern Spy" apples prompted a Google search for the origin of the name. It conjured up images of Civil War treachery in my mind, perhaps the 1860's version of TURN. But, alas, I found nothing so dramatic—just that they're native to New York state and frequently used in making pies. The only other complaint we might make about this product is that there's a significant amount of saturated fat and calories...if we wanted to be picky. But, as mentioned before, it is a dessert after all, and both Sonia and I will tell you that it's worth a few extra minutes at the gym. It's another item you might bring to your family's Thanksgiving Day dessert spread in lieu of something made by hand, and it might just make you the hero of Turkey Day. It's absolutely delectable. Four and a half stars from me. Perfect five from Sonia. It didn't last long enough at our place to try it a la mode...but YES. My wife brought home the sticky toffee pudding and the apple tart a few weeks ago. Not normally a fan of their desserts, the STP was incredible. As good as any we have had in restaurants. Try it with vanilla ice cream for sure. Good to hear the apple tart is also worth trying as I'm still a huge apple pie fan, and my mom did make lot's of pies! On top of the scoop of vanilla ice cream why not heat up some cookie butter and pour that over it. Make sure you have some Lipitor and a defibrillator on hand-lol. :-O that combo shouldn't even be legal! Warm cookie butter on ice cream--this will happen here soon. yum! We bought this and LOVED it too! It was delicious and we can't wait to grab another one! Great review!!! This item has turned into the elusive Unicorn item because we have NEVER found it!! 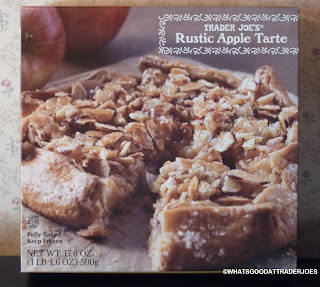 Is this apple tarte still around? Lynda, I bought it at my local TJs last week (Columbus, OH). Good luck!